A SacBee article on October 22, 20151 describes the nearly completed Knights Landing Outfall Gates (KLOG or Outfall Gates) screening project on the Sacramento River: “local, state and federal officials are close to completing a $2.5 million project that will block an entrance wayward salmon use to get into the Colusa Basin Drain”. The operative word here is “an”, because the other entrance, and by far the more important, is the Knights Landing Ridge Cut (KLRC or Ridge Cut) outlet into the upper Yolo Bypass (Map 1). Upstream-migrating Winter Run Chinook Salmon bound for spawning grounds below Shasta Dam near Redding in the Sacramento River can be attracted into irrigation and stormwater drainage system outfalls and eventually lost. The two largest outfalls are the Yolo and Sutter bypasses (see my previous blog on the bypass attraction – http://calsport.org/fisheriesblog/?p=421 ). Of lesser importance are a series of agricultural outfalls from low-lying basins adjacent to the Sacramento River. Chief among these are the Knights Landing Outfall Gates, which drain the Colusa Basin on the west side of the Sacramento River Valley. The new screens on Outfall Gates will ensure that no salmon leave the river for the basin through the gates. But that is not the big problem. The Colusa Basin Drain (CBD or Drain) is also a stormwater drain that can flow mightily in winter storms even in drought years such as 2013-2015 (Charts 1 and 2). When stormwater-driven high flows in the Drain occur, the Outfall Gates’ outlet is usually closed because the river is higher than the gates during storm runoff. Under these high flows, water in the Drain is forced down the Knights Landing Ridge Cut into the upper Yolo Bypass (see Map 1). Storm runoff that passes through the Ridge Cut into the Yolo Bypass attracts many salmon, steelhead, and sturgeon into the Drain and to their eventual demise in the dead-end Colusa Basin. Storm flow to the Yolo Bypass reaches 4000-6000 cfs in drought years, while non-storm flows through the Outfall Gates are usually only several hundred cfs (Charts 1 and 2). Flows leaving the Yolo Bypass and entering the Delta at Cache Slough (Map 2) attract many salmon, steelhead, and sturgeon moving through the Delta. During floods, the Sacramento River spills into the Yolo Bypass, adding even more attraction flows through Cache Slough. With limited passage options past the Fremont Weir at the upper end of the Yolo Bypass (Map 1 or 2), many of fish moving up the Yolo Bypass are attracted to and migrate up the Ridge Cut. In short, the Knights Landing Ridge Cut outlet also needs to be blocked to keep fish from migrating into the Colusa Basin and being lost. The threat is serious not only to Winter Run Chinook, but also to Fall Run, Late Fall Run and Spring Run Chinook, as well as Steelhead, Green Sturgeon and White Sturgeon. Fish passage facilities at Fremont Weir are also needed so that adult fish that migrate up the Yolo Bypass are not stranded in the Bypass. Map 1. Location of Knights Landing Outfall Gates (KLOG) on Sacramento River and Knights Landing Ridge Cut (KLRC) outlet in the Yolo Bypass near Knights Landing, CA. 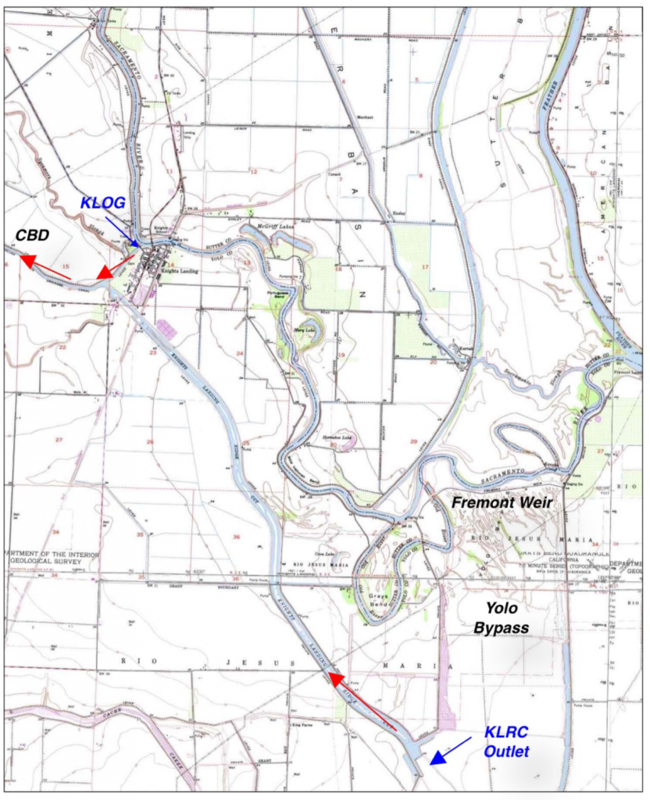 Red arrows point out routes taken by salmon into the Colusa Basin. Chart 2. 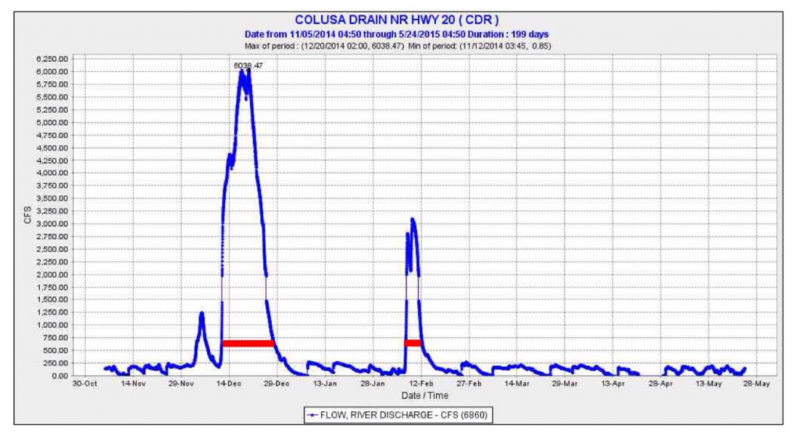 Flow in the Colusa Basin Drain Nov 2014 through May 2015. 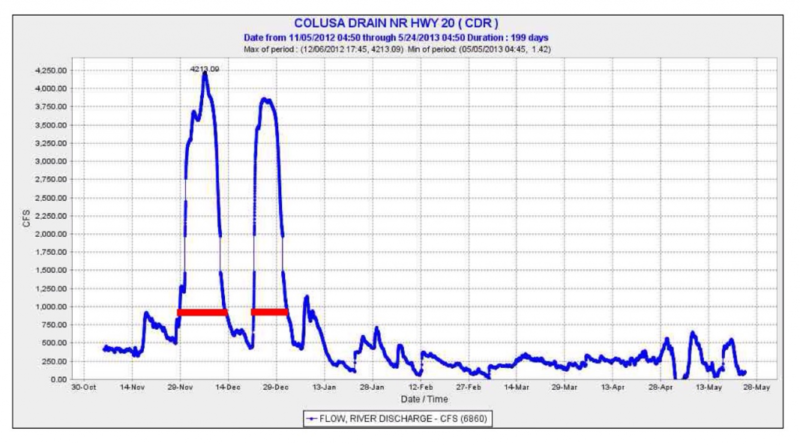 Red line depicts flow when KLOG were closed due to high Sacramento River stage. Map 2. Route salmon take from the Delta via Cache Slough up the Yolo Bypass when attraction flows are input from either the Knights Landing Ridge Cut or the Fremont Weir. This summer’s placement of the False River Barrier in the central Delta has been touted for saving reservoir storage during this fourth year of drought. Question 1. Did the False River Barrier save reservoir water by reducing release requirements? A. Shasta – the answer is no, Shasta retained its prescribed releases all summer. There was thus no benefit of False River Barrier in retaining Shasta’s cold-water pool. B. Trinity – no, it too contributed only to the fixed release to Sacramento River. C. Oroville – releases to Feather River were relatively high much of the summer contributing substantially to Delta inflow. 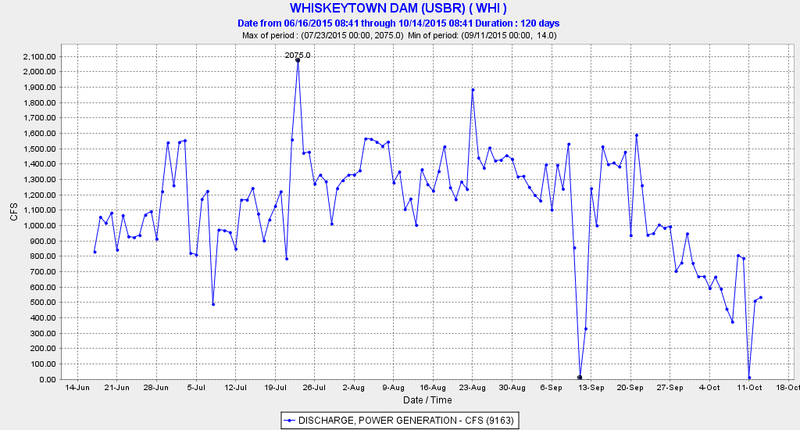 D. Folsom – Releases to American River were relatively high all summer contributing substantially to Delta inflow, although depleting the reservoir’s overall storage and cold water pool. 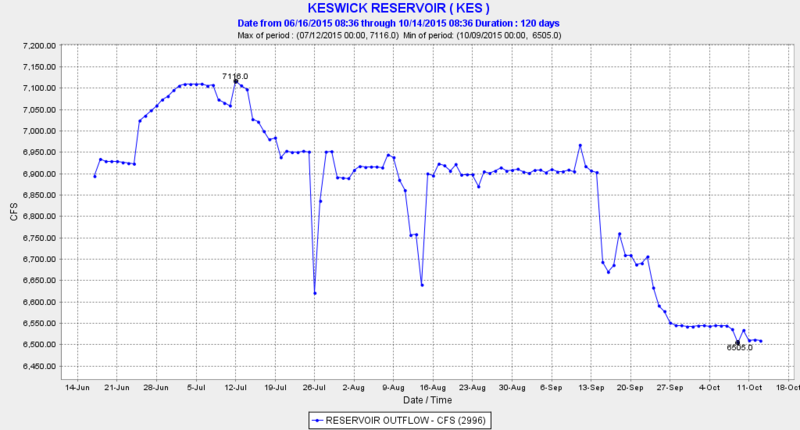 E. New Melones – Stanislaus and San Joaquin flows were minimum all summer. Question 2. Was less freshwater outflow to the Bay required because of the False River Barrier? No, outflow standards were prescribed by State Board and for the most part were met. Question 3. Was less freshwater inflow needed to maintain the salinity standards at Threemile Slough, Jersey Point, and South Delta? Threemile Slough was the controlling compliance point this summer, at times requiring increased Delta inflow and closure of the Delta Cross Channel for compliance. The False River Barrier likely increased the effectives of these measures to lower Threemile salinity. Question 4. Did False River Barrier result in lower salinity in Central and South Delta? No, salinities were higher than either 2013 or 2014. Question 5. Was Franks Tract salinity lower because of the False River Barrier? No, because salinity entered via the lower San Joaquin from San Andreas Landing via the mouth of Old River, as both these sites had higher salinity than in 2013 or 2014. The lower San Joaquin from Jersey Point to Prisoners Point thus suffered higher salinities in 2015 to meet South Delta export demands without False River inputs. Question 7. Were South Delta exports higher than would have been possible without the False River Barrier? Yes, because a higher proportion of freshwater inflow from the Sacramento River via the Delta Cross Channel and Georgiana Slough could be exported with False River closed. The Department of Water Resources’ assertion in the news article that salmon benefitted from the False River Barrier is unfounded. There were no measurable savings to reservoir storage or cold water pools essential to salmon. Salinity found another path into Franks Tract via the mouth of Old River, but to the detriment of upstream movement of the Low Salinity Zone in the lower San Joaquin River. South Delta exports were able to take a higher portion of the freshwater inflow to the Delta from the Sacramento River because of the False River Barrier. Higher South Delta salinities in 2015 demonstrated a willingness to accept higher salinities in exports with the False River Barrier in place or simply an extreme demand for some summer export. Salinities dropped sharply in September with higher freshwater inflows (and outflows) to accommodate South Delta export and water transfers. The transfers were possible as water demands from the Sacramento Valley and Delta sharply declined, and water was sold for transfer south of the Delta. The False River Barrier likely helped facilitate the across-Delta transfers, which declined after the False River Barrier was removed at the end of September. State Water Projects south Delta exports at Clifton Court Forebay summer 2015. Central Valley Project south Delta exports at Tracy Pumping Plant summer 2015. There is an opportunity to alleviate salmon losses during drought years when low river flows and warm water can cause mortality of incubating salmon eggs. The technique was previously used in Alaska that proved to be highly successful in populating under-utilized salmon streams: hydraulic injection of eyed salmon eggs obtained from hatcheries into the natural environment of streams and rivers. It is currently used in some streams in Oregon. Last year, prompted by concerns over anticipated losses of salmon eggs because of warm water, this technique was proposed for the upper Sacramento River and Battle Creek using Coleman Hatchery eggs but was not implemented due to a variety of concerns by the fishery resource agencies. Prominent among those concerns: 1) the technique has never been implemented in California, and 2) it could interfere with the genetic integrity of fall-run salmon in the Central Valley. On this latter concern, as pointed out by Tom Cannon in a prior blog entry, “Studies have shown that [fall-run Chinook] populations across the Valley are homogeneous, with little or no genetic diversity, and consist mainly of hatchery fish and some natural offspring of hatchery fish. There really are no viable “wild” Fall Run Chinook populations left in the Central Valley.”1 Additionally, hatcheries such as Coleman Hatchery purposefully breed natural-origin salmon with hatchery-origin salmon to prevent domestication of hatchery stocks (USFWS 2011). The egg injection concept is as follows. Using facilities at a Central Valley salmon hatchery (e.g., Coleman Hatchery on Battle Creek or Feather River Hatchery), incubate surplus fall-run Chinook eggs in chilled, sterilized water to eyed stage then hydraulically inject the eggs back into the river after water temperatures have naturally cooled to tolerable levels in November or December. The eggs would be injected using an egg planting device invented by Tod Jones and described by his patent and Vogel (2003) (Figure 1). Figure 1. The hydraulic egg planting device. One objective of this approach would be to partially compensate for the anticipated loss of fall-run salmon production during October caused by deleterious water temperatures in drought years. The intent is to repopulate the river with fertilized salmon eggs originating from a hatchery but hatched and reared in the natural riverine environment. Specifically, the intent would be to reseed the river with fertilized salmon eggs to boost future ocean sport and commercial salmon catch, in-river sport catch, and salmon runs returning to spawning grounds. If properly implemented, the survival of salmon eggs implanted in the river can greatly exceed that of naturally-spawned eggs (Tod Jones, pers. comm., September 8, 2014). In addition, this approach would help retain the diversity in spawning timing from the salmon lost during the October spawn in warm, drought years. Because salmon primarily return as three-year-old fish to spawn, loss of a major portion of the early-spawning component of the fall-run Chinook could propagate forward in time such that many future generations of salmon may not possess the early spawning characteristics. If actions are not taken to preserve the early spawning component of the fall run, the run three years hence would not only be expected to be depressed but also lack many of the October-spawning fish. Loss of the October spawning component of the fall run will unfavorably truncate the usual timing of spawning to those fish spawning in November and December. Retaining the early spawning component of the fall run will increase resilience of future salmon runs approximately every three years thereafter. Furthermore, this project could increase the survival of juvenile salmon outmigration. Because fall-run salmon eggs laid during October incubate and hatch earlier than eggs laid later in November and December, the earlier fish are anticipated to emigrate sooner. If the drought persists, an earlier outmigration of salmon would be beneficial because riverine and Delta conditions will be inhospitable for salmon in the spring. For example, the present-day management strategy of Coleman Hatchery is to rear and release the normal smolt production in April when riverine and Delta conditions are more favorable as compared to May when the hatchery previously released salmon during the 1980s. The egg injection technique has great promise for salmon restoration. It could save many salmon during drought years and could be an invaluable technique to rapidly populate new, presently unused areas envisioned for salmon restoration. It has now been 12 years since this project was proposed for implementation in California: Vogel (2003). It would certainly be preferable to doing nothing and could have potentially saved millions of salmon eggs in the fall of 2014 when conditions in some Central Valley rivers were lethally warm. Hopefully, a pilot demonstration of the egg injection project may be implemented in the fall of 2015 in the Feather River thanks to the cooperation of the California Department of Fish and Wildlife and, depending on the outcome, a larger-scale project in 2016. U.S. Fish and Wildlife Service. 2011. Biological assessment of artificial propagation at Coleman National Fish Hatchery and Livingston Stone National Fish Hatchery: program description and incidental take of Chinook salmon and steelhead. July 2011. 372 p.
Vogel, D.A. 2003. Evaluation of a proposal for hydraulic salmonid egg deposition. Report prepared for the U.S. Bureau of Reclamation. Natural Resource Scientists, Inc. October 2003. 36 p.
Water transfers are allowed through the Delta under federal biological opinions during the summer, but in 2015 the period was extended through the fall by the State Water Board, with the approval of the federal fisheries agencies responsible for administering the Endangered Species Act (ESA). There are many types of water transfers, but I am referring specifically here to transfers of federal Shasta-Trinity storage through the Sacramento-San Joaquin Delta to state and federal water contractors south of the Delta. Water released from Trinity and Shasta reservoir storage is passed down the Sacramento River into the Delta where it is exported in the south Delta and then delivered to south-of-Delta water contractors (who purchased the water from northern California contractors who have priority on the Shasta-Trinity water). This was the largest component of water transfers in the Central Valley in 2015. This week, the Delta Stewardship Council held a workshop on these transfers through the Delta. The Council concluded: “On the issue of single-year water transfers and whether they impacted the coequal goals and therefore should be subject to the Delta Plan’s covered action process, the Council did not feel they had all the information they needed, so a determination was made to exempt single-year transfers from the covered action process until December 31, 2016, and a request made for further information.” 1In other words, the Council decided it needs more information before it can support these single-year water transfers. I agree with Dr. Herbold. The big impact is in the loss of Shasta-Trinity storage, which can be seen in the release of Keswick Reservoir water to the Sacramento River near Redding in the figure below. Sacramento River releases recommended in the 2015 Salmon Plan developed by the State Water Board, fisheries agencies and the Bureau of Reclamation called for 6000 cfs for September and 5500 cfs for October. 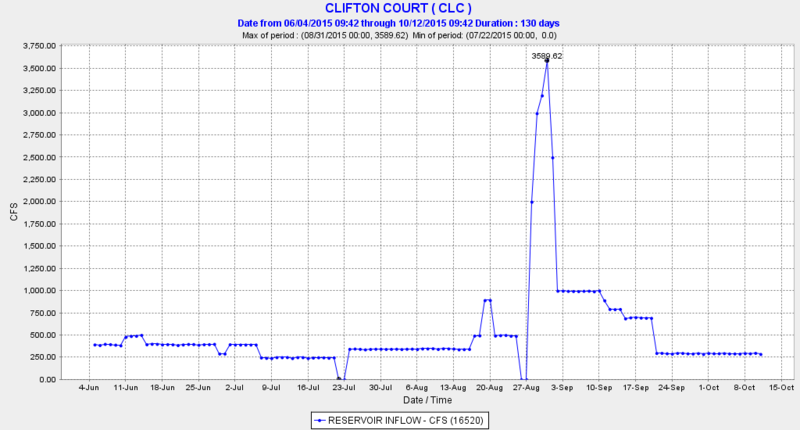 The 500-1000 cfs extra in September and 1000 cfs extra in October amount to approximately 80 TAF of “extra” storage releases that have gone to transfers so far this year in just six weeks. 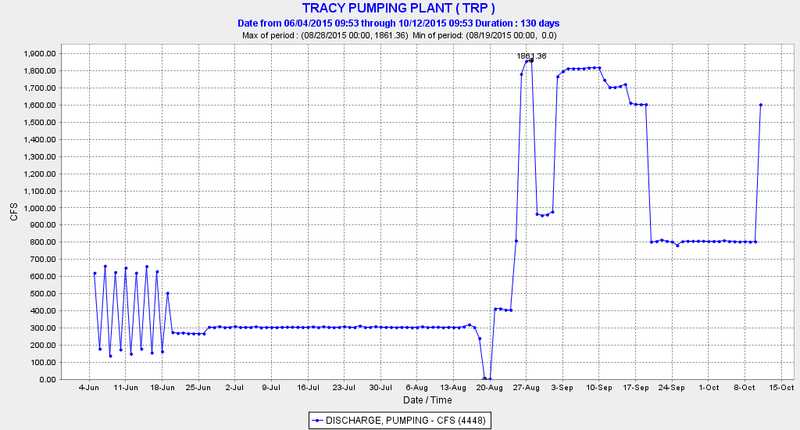 The diversion from the Trinity River as seen below as Whiskeytown Reservoir power releases to the Sacramento River (most to Keswick Reservoir via Spring Creek Powerhouse) amounted to approximately 80 TAF between September 1 and October 14. This water represented over 10 percent of the remaining water in Trinity Reservoir, already at critical low levels after four years of drought. This new low level is well below the critical end of year storage level needed to sustain flows through the winter and next year’s cold-water pool for Klamath-Trinity salmon. Because Shasta’s cold-water pool has been needed over these same six weeks since September 1 (and prior to that) to cool the warm Trinity water before it is released to the Sacramento River from Keswick Reservoir, Shasta’s cold-water pool and storage has also been used for the transfers. Shasta Reservoir’s cold-water pool and storage are needed to sustain salmon through the fall, but also the entire water supply for California next year. Shasta Reservoir is now down to 1.6 MAF out of its 4.55 MAF of capacity, its lowest level since the 1991-92 and 1976-77 droughts. These transfers also have significant effects on the Delta and its low salinity zone critical habitat for native Delta fish species, including the Delta smelt. Delta exports are the mechanism for transferring water from the north to the south. Transfers are evident in recent Delta exports. As shown in the chart below, CVP exports increased in amounts between 600-1500 cfs in September and early October in response to CVP and other transfers. Most of the extra CVP export was sourced in Shasta and Trinity reservoirs. State Water Project transfers through the Delta also occurred (see next chart). With flows through and out of the Delta to the Bay very low in this critical drought year, such exports have higher than normal environmental effects; however, transfers are exempt from restrictions applied to project exports Even large volumes transferred at once do not trigger additional protections from the effects of pulling more water and more fish from the Sacramento River into the central Delta. We are glad to see that Mr. Howard has at least acknowledged these impacts. During drought workshops in 2014 and 2015, CSPA objected to this free pass for transfers through the Delta for years, calling them “the phantoms of the exports.” In early 2015, Mr. Howard explicitly re-authorized their special exempt status. CVP Exports in summer 2015. The total “extra” export is less than the total transfer by about 20 %, because some transfer water is required to pass through to the Bay as “carriage water” to repel salinity. SWP Exports in summer 2015. Most of the SWP transfers were in early September. One often hears during this present four-year drought about all the water being “wasted” on the Bay-Delta environmental water. The fact is that, other than the millions of acre-feet going to water supply diversions, most of the so-called “environmental water” goes to repel salinity so that water entering the Delta may be exported. Very little water is going directly to help the Bay-Delta estuary ecosystem. Last winter and spring, storm water not captured by reservoirs did reach the Delta in modest pulses. These pulses were protected to some extent by restrictions on exports required by biological opinions and state water quality standards. Other than these environmental protections that served during these short pulses to help young salmon pass through the Delta, there has been little “environmental” water for the rivers or Bay-Delta since 2012. Outflow requirements, salinity standards, and export restrictions were weakened or simply not enforced during the past three years. All the reservoir releases were designated for water supply diversions. Over 1 MAF of Shasta releases went to Valley water contractors. Over 2 MAF of reservoir releases went to the South Delta state and federal exports. Over 1 MAF went to Delta farmers. About 1 MAF went to repelling salinity to make the 3 MAF of Delta diversions possible. Some excellent information and discussion was presented on the topic of repelling salinity this year. One of my favorites is a YouTube video (https://youtu.be/9M4XcLQkqEM ) that shows how salt attacks the Delta during a typical lunar tidal period. Another is an article in the San Francisco Estuary Partnership newsletter on the Delta salt-field (http://www.sfestuary.org/salt-field/ ). A great tool for viewing the dynamic Delta salinity field can be found at: http://www.baydeltalive.com/salinity. The newsletter article recalls a recent ad hoc meeting of Delta scientists, modelers, and managers trying to come up with drought mitigation strategies that “wouldn’t burn so much water to keep the salt field at bay”. In other words, they were looking for ways to export more of the reservoir water entering the Delta. Those at the meeting discussed cutting exports, opening the Delta Cross Channel gates, and ceasing operation of the Suisun Marsh salinity control gates. Other than the obvious benefit of reducing exports (contrary to the meeting’s purpose), the other two options were to eliminate key environmental protections. Jon Burau (USGS) was quoted as saying: “these would be the quickest, least expensive things we could do to save water that would also have the least impact on the ecosystem.” The cross channel gate closures are required in biological opinions and water quality standards in winter-spring to keep endangered Sacramento River salmon and steelhead from entering the Central and South Delta and being lost. The Marsh salinity gates are critical in the management of the Marsh wetland ecosystem and maintenance of Montezuma Slough’s critical habitat for the two listed smelt species. In 2015, Department of Water Resources (DWR) added a salinity barrier to the existing array of Delta barriers: the False River Barrier was eventually installed to keep salt from entering the interior Delta through Franks Tract. At the behest of DWR and the Bureau of Reclamation, the State Water Resources Control Board weakened the salinity standard by moving the compliance point five miles from Emmaton to Threemile Slough. The Board also weakened the Delta outflow standards that keep the Low Salinity Zone out of the Delta, “saving” up to several thousand cfs. In a completely unprecedented action this summer, Reclamation actually closed the Delta Cross Channel to keep salt from the salinity control site at Threemile Slough near Rio Vista. This action was possible because of the presence of the False River Barrier. The goal for managing the Delta this year was simply to keep the salt level of South Delta exports at or below the 800 EC level. With the Delta “scientists, modelers, and managers” who manage the Delta water system thinking in terms of water “burn”, four independent Delta ecosystem scientists recently wrote a paper on the “Challenges Facing The Sacramento-San Joaquin Delta: Complex, Chaotic, or Simply Cantankerous? “1. They describe the “Delta Problem” in terms of “wicked problems” – “Such problems can’t be ignored, defy straight-forward characterization, and have no simple solutions. Yet they must be actively managed to maximize beneficial and minimize adverse outcomes”. (From ‘DeltaChallenges-v13,’ page 6). With such divergent philosophies managing the Delta, it is no wonder the Delta Problem is perceived as “wicked”. The four scientists further conclude that “opportunities exist to conserve and restore aspects of the native system and to structure the rest of the Delta to make it more hospitable to native species. 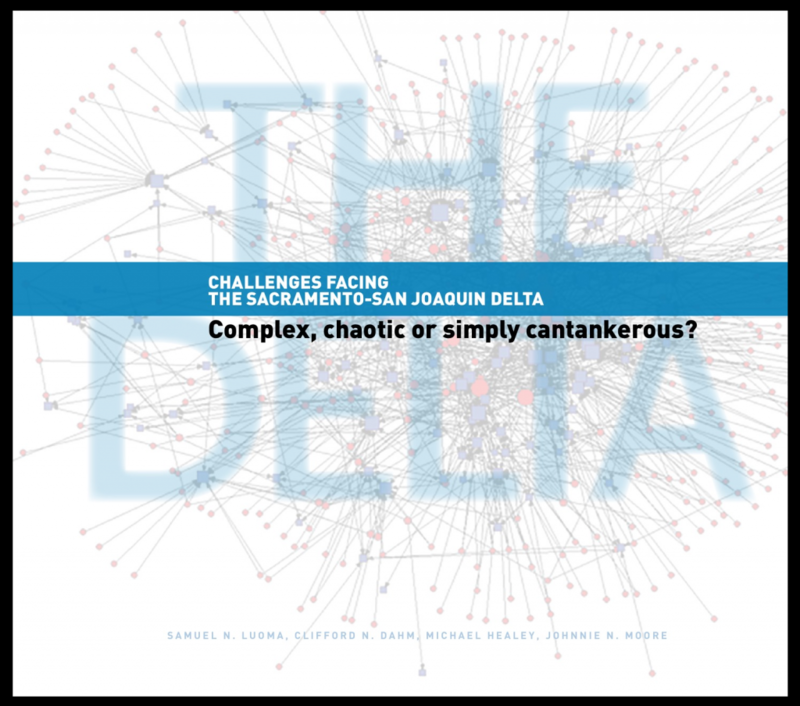 Realizing those opportunities without jeopardizing water supply is the ultimate challenge in managing the Delta.” (From ‘DeltaChallenges-v13’, page 28). It appears that one side is intent on minimizing water “burn”, while the other deals with the resulting “wicked problems” that come from the focus on water supply. It is a not “wicked problem.” It is a matter of switching the focus of Delta management away from minimizing “water burn” to maximizing ecosystem health and protecting endangered fish with the water available. The Valley river and Delta water quality standards for dry and critical water years were developed to provide minimal protections. Step 1 should be to maintain and enforce these standards for streamflow, water temperature, and Delta outflow and salinity. These standards could have been retained in each of the past three years with just 10% of the 4+ MAF of reservoir water delivered for water supply. If there are really “co-equal” goals, then the ecosystem getting 10% instead of near zero is a bargain. If we want to begin recovery of the Bay-Delta ecosystem from its present near-death state, we should be considering a much larger percentage of dry year water supply to meet the “co-equal” goal. Climate change is putting a real hurt on California water supply that is very real and likely long lasting. Hard decisions and massive investments will be needed to adjust to a more reliable water supply system. However, the ecosystems and native species of California rivers, the Delta, and the Bay should not be sacrificed in the short term for the sake of water supply. The threatened and endangered fish depending on our California ecosystems cannot wait. They need the water now to survive.